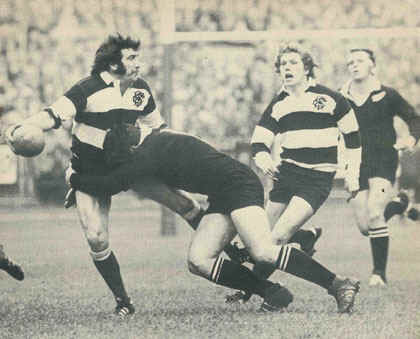 'This is great stuff... Phil Bennett covering ..……ch ch chased by Alistair Scown... brilliant... Ooooh, that’s brilliant! John Williams, Bryan Williams ...Pullin, John Dawes ...Great dummy! ...David, T Tom David ...the half way line ...Brilliant by Quinnell! This is Gareth Edwards! ...A dramatic start! ...what a score! "I was a great admirer of Gren. 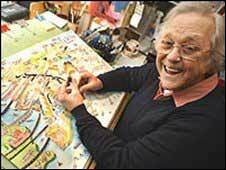 To me he was a Max Boyce on paper and a Harry Secombe in humour. He raised a large amount of money for charity, he was crazy on rugby and was the only Welshman I'd ever met who sang out of tune deliberately. He had his finger on the pulse of Wales." 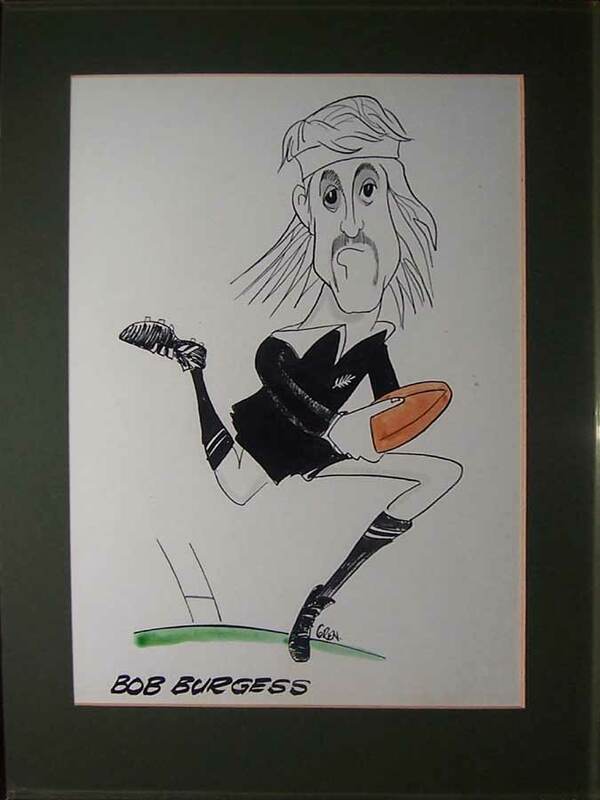 ...................We have in the museum a collection of original caricatures by Gren of the Barbarian players and of five of the All Blacks in opposition that day, Gren ! 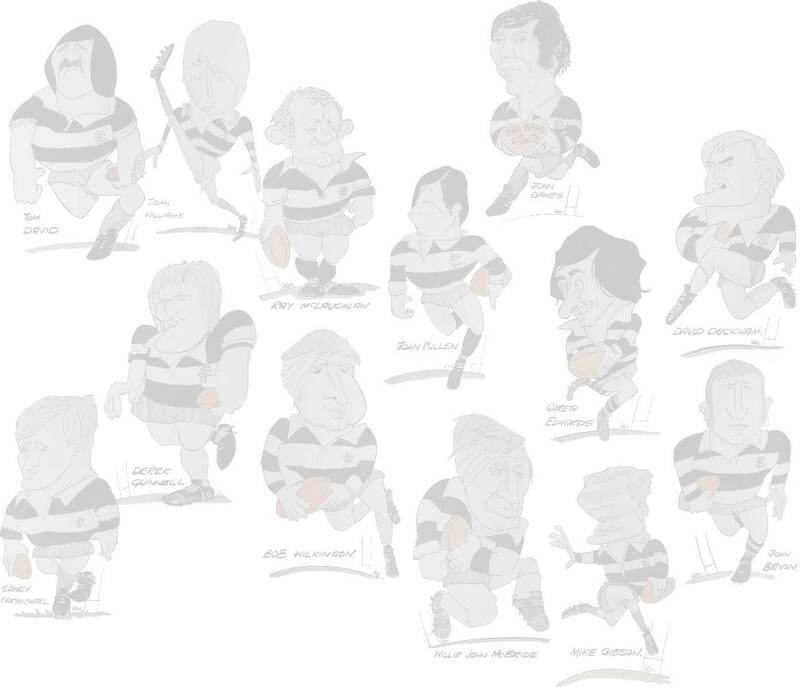 Pictured below are the caricatures by Gren of 14 of the Barbarians from that day, these truly are classics !!!! Phil where are you ? Missing from the collection, location unknown is that sidestepping genius from Llanelli, Phil Bennett ! There are 5 All Blacks in the collection including the fiery Grant Batty, Gren's portrayal of this great All Black winger is nothing short of genius ! We were on holiday in Wales and had been over the Brecon Beacons, Burry Port, Kidwelly & Abergavenny and I had a bugger of a toothache for several days, I phoned several dentists to see if any could help. I got one in Abergavenny provided I could make it before 9.00am & I did. The dentist asked if I was going to the game and I said no as i couldn't get a ticket. He asked if I would go if I could get one and i said I would do jail for one ! He left the surgery for a few minutes, came back and said "here's 2, we were to go but our child is not well and we are not going, have these on me and enjoy it. It was almost surreal but bloody great !!!! We will be adding our memorabilia collection relating to this game soon, please come back and visit again. Do you have any personal recollections of this match, send us your story please ! 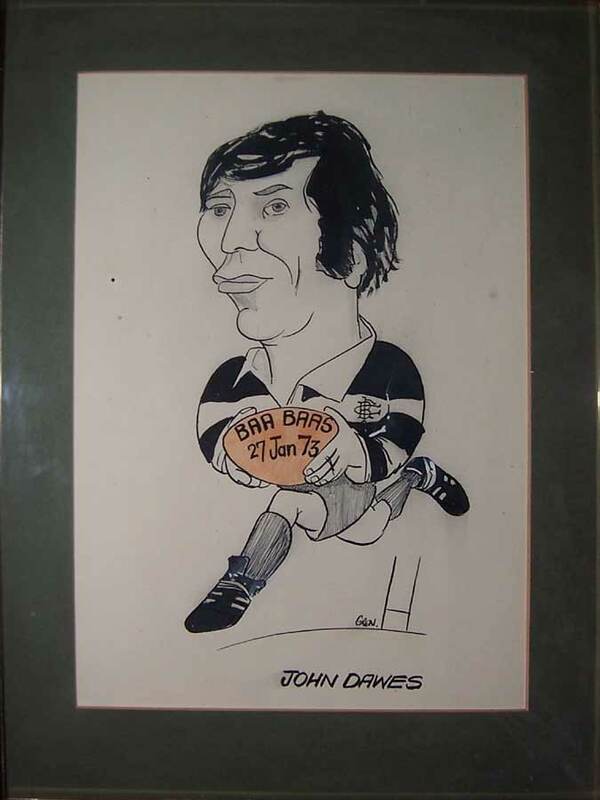 To purchase the match day DVD, official programme, post match reports in magazines etc please visit the Rugby Relics Barbarians Memorabilia page on www.rugbyrelics.com . To visit this page please click on the link below.